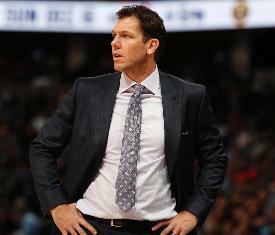 Speculation became reality on Monday when the Kings announced the hiring of the 39-year-old Walton. Terms weren't revealed but The Athletic's Sam Amick reported Saturday that the two sides had reached agreement on a deal that is expected to run through the 2022-23 season. "I have known Luke for many years and I am so excited to welcome him and his family to the Sacramento Kings," Kings general manager Vlade Divac said in a statement. "I look forward to his leadership on the court as we work to build a winning culture for many years to come." Walton compiled a 98-148 record in three seasons as coach. Los Angeles missed the playoffs in all three seasons. Walton's status had been tenuous, even before Magic Johnson resigned as president of basketball operations on Tuesday. Lakers owner Jeanie Buss was reportedly ready to OK a departure after previously being fully supportive of Walton. The Kings went 39-43 this season under Joerger and have an impressive young group led by point guard De'Aaron Fox, shooting guard Buddy Hield and power forward Marvin Bagley III. Sacramento's record was its best since 2005-06 -- the last time the franchise qualified for the playoffs. Walton will be the franchise's 10th coach since Rick Adelman left Sacramento in 2006 after eight seasons. Joerger, who was fired on Thursday, had a 98-148 in three seasons with the Kings.